On a hot summer day, nothing quite hits the spot like a fizzy glass of ice-cold soda. Or maybe you love to go out for a weekend brunch and sip some orange juice while you’re eating. These beverages certainly taste good, but they’re not good for your teeth. 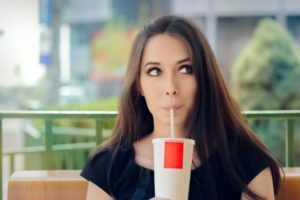 As your dentist in Wakefield explains, soda, citrus juices, and other liquids that contain high levels of acid can put your smile in some serious jeopardy. Tooth enamel is the hardest substance in the human body; in fact, it is even harder than steel! However, that doesn’t make it invincible. Acid can erode it, gradually washing away tiny bits of it. If you consume acidic drinks too often, your enamel may become so worn that it exposes the dentin underneath it. The dentin connects to the nerves in your teeth, which means that you could end up suffering from severe sensitivity and other dental health concerns. That isn’t the only problem with acidic drinks. Dentin is naturally yellow in appearance, so if your enamel gets worn thin enough, you may notice that your teeth lose their beautiful luster. It’s best to choose drinks with a higher pH. Milk, water, brewed coffee, and brewed tea should all be safe for your smile. Can’t Say No to an Acidic Treat? Drink the beverage through a straw so it has as little contact with your teeth as possible. Don’t take a long time to sip on the drink. Every sip exposes your teeth to a new acid attack, so drinking the beverage fairly quickly can cut down on the amount of time that your teeth are vulnerable to damage. Rinse your mouth with water after you finish your drink. Brush your teeth about 30 minutes after you’re done with the beverage. Don’t brush sooner because you might end up accidentally causing more damage to your temporarily weakened enamel. Enjoy your drink with a meal instead of by itself. Acidic drinks are yummy, but they could cause serious damage to your smile. Please protect your pearly whites from them so you can enjoy healthy teeth for many years to come! Dr. Rob Schumacher is your friendly, experienced dentist in Wakefield. He is an ardent advocate of preventive care and always strives to educate his patients on how they can protect their teeth. If you have questions or concerns about your oral health, he would be happy to help you. Please contact our office at 781-334-3400.